Which Pool Filters is this for? What about “Pool Filter Cartridge Spray Cleaner Tools”? When should you clean a Hayward pool filter? 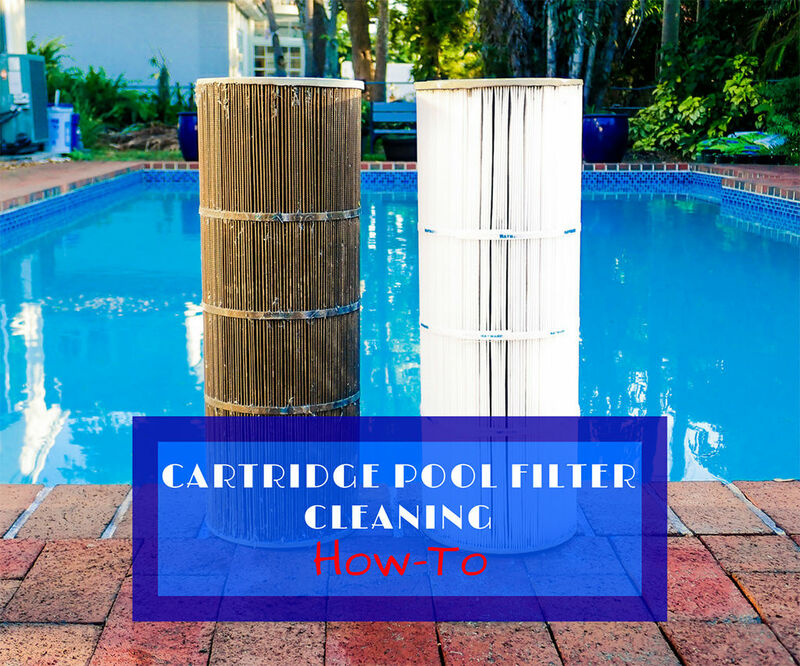 Note – When should I replace my pool cartridge filters? This DIY was done using a Hayward C3030 SwimClear Cartridge Pool Filter. Here’s the Owner’s Manual if your interested. It has four cartridge pool filters made out of pleated reinforced polyester. 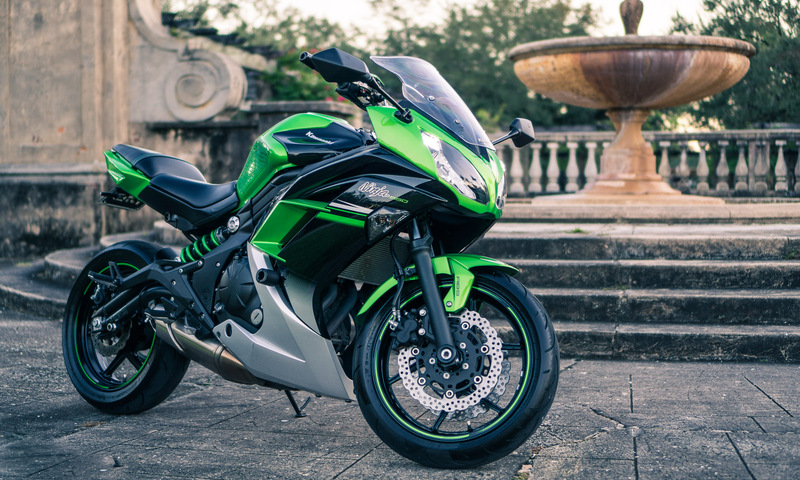 In any case, you can still follow the guide regardless of what brand or model you have. Simply skip over the model-specific details. Most of this you might have already, but probably not all of it. Here’s a list of the items and tools I used to clean a Hayward pool filter as shown. This is the most important product. Before specific cleaners for everything became a thing, TSP was a staple for general purpose home cleaning. Just take a look at the ingredients of a few “Heavy-Duty” cleaners and you’re sure to find TSP or a TSP substitute. It’s still widely use for cleaning prior to painting since it is very strong, cheap, non-foaming and easy to rinse away with water. With regards to cartridge pools filters, TSP has been the go-to product for years – Unicel (one of the largest cartridge filter manufacturers) even officially endorses the method here. 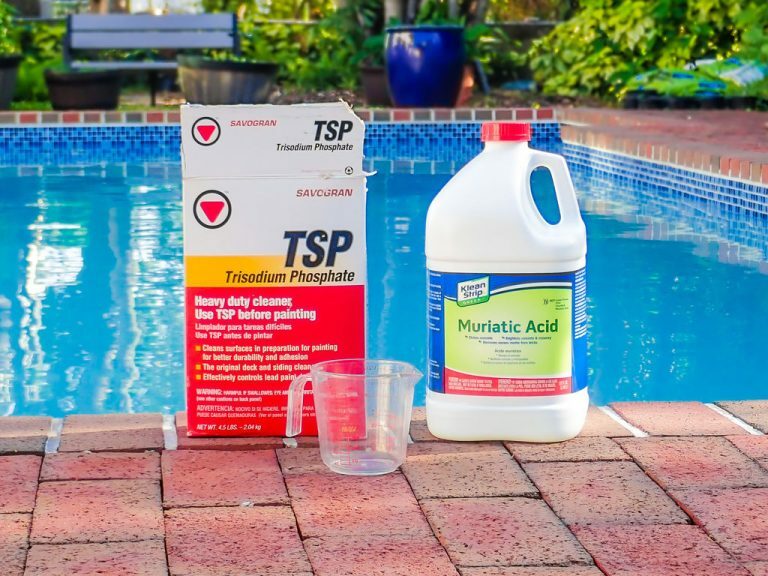 It just is the best household product to clean a Hayward pool filter. In my case (four large cartridge filters), I used 4.5 lbs to wash the cartridges twice. One benefit of TSP over normal soaps is that it won’t create never-ending soapsuds, which would be undesirable here. As an alternative dishwasher detergent can also be used in a pinch. Also known as Hydrochloric Acid. It’s a typical household and pool maintenance product. Muriatic acid will help clean the filter of algae, iron, calcium carbonate (residue from calcium hypochlorite), or other minerals. You will need approximately 1 to 2 gallons if you’re cleaning your filters in a large trash can. It isn’t absolutely necessary to clean a Hayward pool filter, but it will give the best result. Measuring Cup – You’ll need to dose some slightly nasty chemicals, so your significant other might not appreciate you using the kitchen’s measuring cup. Your call. Plastic Trash Can – Depending on the number and size of the filters you’ll be cleaning, you might be good with a 5 gallon bucket, or you may need a 50 Gal. trash can. You probably already have one already. In my case I used a 45 Gal. plastic trash can which was perfect for the job. Make sure you take note of the can’s size since you’ll be using it to make the calculations later. Multi-Function Hose Spray Nozzle – Preferably multi-function and one that doesn’t require keeping a lever held down continuously. That gets old soon for a job like this. I found the “Flat” setting to work best on this nozzle. Silicone Paste – Unless you want to spend upwards of 50$ to replace all the rubber seals and gaskets, you’ll want to recondition the seal. The best option to help lubricate and seal the o-rings will be some silicone paste. 3/8″ Drive Ratchet – To loosen the housing’s retainer ring. 3/8″ Drive Torque Wrench – Since the owner’s manual gives the spec for torque, I’d recommend the use of a torque wrench to properly get the right amount of pressure for a leak-free result. It isn’t crucial, but it helps do it right. 19mm or 3/4″ Socket – For the retaining ring bolt. You may need a different size if your filter is from a different brand. Nitrile Gloves – Especially important for handling the muriatic acid. You should also find some safety glasses. Rubber Mallet – To remove the filter’s housing retaining ring in case it’s stuck. Rags and/or Paper Towels – For general cleaning. Honestly, most of them will be little more than TSP and unnecessary additives or fillers. Or worse, they just use acids. Really, to clean a Hayward pool filter I’d just recommend you use this – It’s a lot cheaper and does as good if not better. Unless the manufacturer of your filter mandates a specific product, of course. TSP should be the most versatile, cheapest solution. After all, a manufacturer can’t really claim to have a “premium and durable reusable filter” if it were susceptible to such a diluted cleaning product. If you’ve done your homework, you’ve probably seen Pool Filter Cartridge Spray Cleaner Tools made specifically for, well you guessed it, cleaning cartridge pool filters. If you already have one, by all means, use it. But if not I don’t see these worth the additional expense. It’s just another hose attachment to damage or lose. Your typical multi-function hose nozzle will do just as well and will serve for many more purposes. Just make sure it has multiple water patterns. When the filter was first installed, pressure while the motor was running was at 10 PSI. Now it’s at 18 PSI, almost 2 years later. You should clean a Hayward pool filter when the pressure increases by 8-10 PSI. So it’s time. Prior to reading the pressure gauge, remember to turn the pump on. If you have a two-speed pump like in this case, take the measurement while on High Speed. 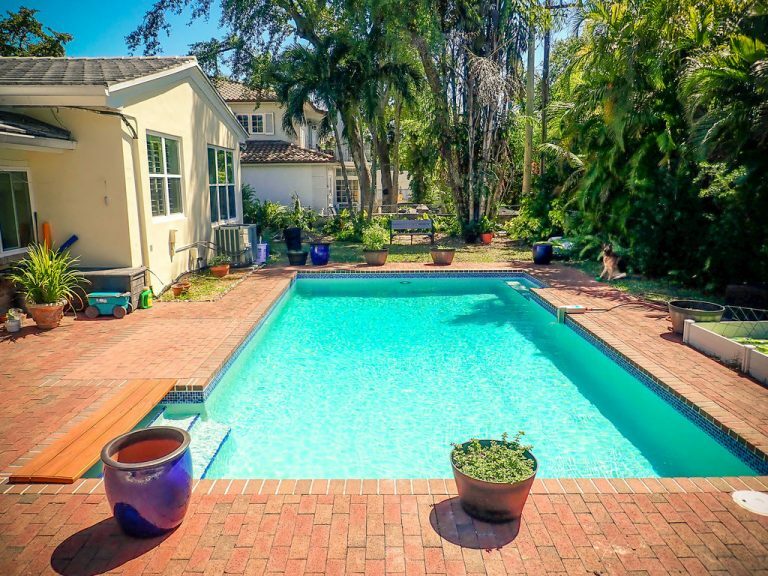 When it comes to deciding how frequently you have to clean a Hayward pool filter, thankfully you don’t have to guess. Take a look at your cartridge pool filter’s gauge – it will objectively tell you. In the case of this filter, it should be cleaned when the pressure increases by 8 to 10 PSI over the pressure initially measured with a clean filter. Normally your gauge should even have two arrows telling you when it’s time to clean. At least as long as it was properly configured when installed. In my case, it took almost 2 years to need cleaning – though I recognize that may be the exception rather than the rule. I purposely over-sized the pool filter precisely to allow for longer intervals. If your cartridge filter is undersized or your environment very dirty, I’d recommend installing pool skimmer socks or hosing down the cartridges (without chemical cleaning) every few weeks or months, as needed. Also, to help lengthen intervals, I’d recommend periodically opening the drain valve on the bottom of the cartridge housing and then closing the pool’s output to flush any debris inside the housing out. That way you avoid silt or other gunk accumulating at the bottom. It would be best to do this once a month. To reach the filters, you’re going to have open your filter housing first. At this point you should probably take a moment to close all the inlet and outlet valves going to the pool. Also make sure that the pump will not be turning on if you have a timer. On this particular model, this single bolt is what holds the top and bottom halves together. We’re going to have to remove it. Let me go look for my saw. For this Hayward DEX2421JKIT clamp, we’ll need either a 3/4″ or a 19mm socket. I went with metric since I like using the right unit system. The clamp has a hinged design. If it doesn’t want to come out on its own, give it the good ol’ tappy tap tap routine with a rubber mallet. Once you remove the top half, this is the sight you should see. Feel free to remove that big plastic piece at the top. I haven’t seen anything this nasty since my teenage laundry bin! I installed a ball valve drain to be able to flush some of the gunk that accumulates at the bottom on a monthly basis. I’d recommend you do the same to increase the interval between filter cleanings. In either case you’ll want to open the port now to drain the filter housing. The first step would be to turn off the pump and close all the inlet and outlet valves, if possible. This is especially important if the pump runs on an automatic timer. Then, use a socket and a ratchet to remove the bolt holding the clamp together. You’ll need a 19mm or 3/4″ socket. Once it is removed you may need a rubber mallet to loosen the clamp if it’s stuck on. Once it is off, the top housing can be removed, revealing the filters. Water will fall out when the top is removed. To avoid a vacuum being created open the breather valve at the top (the orange lever) or drain the pool filter housing altogether first. The following step to clean a Hayward pool filter is to remove the Top Manifold and then the Filters. To help remove the filter cartridge elements apply a slight rocking motion while lifting up. In my case, the Air Relief Filter Screen was falling apart and needed replacement. For any of these Hayward SwimClear filters the screen is the same part, regardless of the size. There’s a good chance yours will be in a similar condition if you need to order it in advance. Ebay probably has it cheaper than most local pool stores here. The first step is to flush all the gunk out with water. There’s no need to use one of those fancy “filter cleaning tools” (unless you already have one). Any hose nozzle will do, though some patterns are better than others. Remember to use moderate water pressure and maintain a 45 degree angle. DO NOT use a pressure washer. Choose carefully where you are going to clean your filters prior to starting. I’d recommend on grass. Doing it here left pounds worth of decomposed leaves, fiber, silt and dirt to clean up afterwards. Nothing toxic, but it’s a hassle to clean up. On the other hand I’m sure your lawn will love the stuff. Once you remove all the filters from the housing, this will give you an idea of the work you’ve got ahead. Don’t worry, it isn’t as bad as it looks. And remember to keep them constantly wet since you don’t want the crud to dry up and be harder to remove. As quickly as possible after removing them from the water, rinse the filters off. Use moderate pressure from a regular garden hose and maintain at least a 45 degree angle to avoid damaging the filter. No pressure washers! The last thing you want to do when you clean a Hayward pool filter is to damage it. Place emphasis in flushing the debris out from between the pleats. You can also carefully brush the pleated surface to remove small particles and debris. I didn’t find it necessary. You will remove a great deal of crud from the filters, probably more than you would have imagined – picture attached for illustrative purposes. The filters were actually substantially lighter after cleaning, ironically enough. Choose the spot where you intend to clean the filter well, to minimize clean-up later. I’d recommend on grass. It’s just decomposed leaves, silt and fiber, so it isn’t toxic. Just annoying. I decided to use a 40 gallon trash can since it was the only suitable container I had that would fit four huge cartridge filters. Clean it, and then pour in the TSP. You are going to want to use one cup of TSP per five gallons, roughly. This white powdery stuff is Trisodium Phosphate – TSP. You’ll want to use 1 cup per five gallons for this application. Once you drop in the filters, the cleaning effect will be obvious shortly after. Make sure to keep the filters fully submerged however you can (they will want to float). After leaving the filters submerged (overnight is best), rinse it off to get any loosened dirt out. You want to fill a bucket (or trash can, in this case) with water, and use approximately 1 cup of TSP per 5 gallons of water. I used roughly 2 pounds worth. Submerge the filters completely, and leave overnight if possible (3 hours minimum). Regarding using TSP substitutes instead of TSP, some users report lukewarm results compared to using the real thing. Given how sporadically filters are cleaned, I’d try to find the real stuff. One cup dishwasher detergent to five gallons of water can also be used, but be aware that dishwasher detergent (for machine washing) isn’t the same thing as dishwashing detergent (for hand washing). Dishwasher detergent is designed to not foam as much, and many are mainly TSP substitutes. While the filters are having their bath, take advantage of the break to clean the filter housing. Rinse it well to flush all the dirt that accumulates at the bottom out. With the outlet valve open of course. Try to get as much dirt out of the bottom as possible. I wanted to go all-in since this is done so infrequently. I closed all the valves and used some TSP to clean the inside of the filter housing. Now would also be a good moment to clean the filter housing where the clamp sits to save you time on reassembly. Clean the clamp too. That way no debris under the clamp’s lip will impede on its ability to properly seal the housing. I reassembled the filter housing (after all, it’s only a clamp and a bolt) to fill it completely with water (plus the TSP added previously). By removing the breather fitting at the top I could completely fill it with water for the best cleaning. I used a long bamboo rod to stir up the TSP+H2O. Anything long and slim would have done the job. You can tell that the solution is doing its job. If you have the time and TSP left over, give it a second bath. Might as well since there is still some gunk between the pleats that can be removed with the right incentives. It’s surprising how much silt can still be removed from between the pleats. Since it had been so long since the cartridge pool filters were cleaned, I gave them a second TSP bath. Everything is the same as before. If you want to go the extra mile, give it a muriatic acid bath. Estimate how many gallons of water you need to submerge the filters, and then divide that number by 21 to get the amount of muriatic Acid you need. In this case I used 1 Gal. for a relatively weak solution (mainly because that was how much I had on hand). Also, remember to use gloves and treat the acid safely. This is what we’ll be using. Pretty much any bottle that plainly states “Muriatic Acid” should do, regardless of the brand. Submerge the allegedly clean filters in the acidic solution to let it do any work left. Also, do not do this if the filters are not completely removed of oils or any detergent, since it might damage the filter. Nothing like an acid bath, is there? Slight bubbling should be normal and expected, depending on how much acid is used and how dirty the filters are. After submerging the filters, rinse the surroundings off in case any acid fell on them. Muriatic acid is typically used for cleaning surfaces like this (so it shouldn’t do harm), but you wouldn’t want to leave it on too long or run the risk, anyway. After leaving the filters in overnight, rinse them off immediately after taking them out of the bath. Should the filter have a coating of algae, calcium carbonate (residue from calcium hypochlorite), iron, or other minerals, a muriatic acid bath will help clean it. Personally, I think that if you’ve made it this far, you might as well do it even if the filter looks clean for good measure. It’s the finishing touch when you clean a Hayward pool filter. However, make sure all oils and cleaning solution are removed before soaking the filters in acid as it might otherwise permanently damage filter. Though if you cleaned the filter as thoroughly as illustrated here there is little to worry about. You will want to use 1 part Muriatic Acid per 20 parts water. Regarding the ratio, some recommend as much as 1:1, or as little a 1:29. In this case, I simply used one gallon of acid with as little water as needed to completely cover the filters – I estimate some 25 gallons. Remember to use gloves and safety glasses, as well as rinse any surfaces where acid may have splashed. If any acid falls on you, well, at least you can just take a leap in the pool. Leave the filters in the bath overnight, or at least until the filters stop bubbling (if bubbling is present). Once you take them off immediately rinse them off in abundant water. To dispose of the bath, you can neutralize it with baking soda or ammonia. Or you can just dilute it as much as possible and pour it over your wet driveway or any safe location. And finally, give them their last flush with water. Virtually no dirt or silt should be coming out anymore. It’s definitely nice and clean now! It’s hard to believe that it’s the same filter that was before completely covered in slime. You’re almost done! Give the filters their last wash. Virtually no dirt should be coming out of the pleats at this point. You can already see it’s been worthwhile to clean a Hayward pool filter this way. Boy, what a difference! Make sure to replace the filter holder at the bottom before installing the filters. Take note of how the filters sit lower than the PVC pipe. If it doesn’t, turn the bottom piece around. Reinstall the top AFTER you have cleaned and, if desired, lubricated the O-ring on the PVC pipe (detailed in the next step). This is the O-Ring that was on the PVC pipe. Thanks to the chlorine, it’s a bit deteriorated. I’m not about to replace it just yet so I’ve cleaned it and lubricated it with some silicone paste to help it seal. If desired, you can also apply a tiny bit to the groove, but it shouldn’t be necessary. Next, clean the lip where the large O-ring sits. Clean it as well as possible. This is the main housing O-ring. It too has seen better days, but it costs about 40$ to replace so I’m going to try to postpone that for now. Clean the seal well and inspect it for major damage. To help the ring seal better, I also applied some silicone paste here. The manual cautions against using lubricants in general, so it’s your call. My seal was a bit leak prone so I’d rather this than replace the seal just yet. I’ll confess I over did it, but there isn’t much harm in that. Vigorously remove any excess paste from the inner lip. You want as little paste as possible exposed to the inside of the tank as possible. Before reassembling, check the condition of the seals. In my case, they look like they’ve seen better days but they’re usable. I cleaned them well and applied silicone paste (paste, not grease) to help recondition them as well as aid in sealing. I definitely like this paste in particular because of how thick it is, making it perfect for plumbing jobs. The manufacturer cautions against applying lubricants, but then again that would contradict the fact that they sell their own equivalent product stating that it is “Used on all metal parts or gaskets exposed to water, salt, pool chemicals or constant water pressure”. I personally used it to avoid both leaks or having to replace an expensive gasket. Decide where you want the clamp’s “ears” to be located. In theory it should be near the warning label. Apply some paste to the bolt as an anti-seize for ease of removal later on. The manual lists the torque spec for the clamp nut at 150 inch-lbs, so you might as well do it right if you have a torque wrench available. That did feel like less pressure than you would have imagined is needed, so the torque wrench is useful. Now let’s reassemble the housing. Reinstall the clamp, lubricate the bolt threads if desired, and tighten the bolt. Hayward lists the torque spec at 150 inches-lbs, which is less torque than you would have expected. I’d recommend using a torque wrench just to be objective. Before you turn the pump back on, do your filters a favor and clean out the big debris that have accumulated in the meanwhile. The pool’s water level probably went down from opening the housing or messing with the system. Now would be great time to refill it. One of these automatic fillers is perfect for the job. While the filter housing reassembly is completely done, I’d recommend cleaning the pool of major debris before starting up the pump. The last thing you want to do after you clean a Hayward pool filter is to get it dirty right away. That way we’ll have the most accurate measurement of initial pressure in the filter housing. Also remember to clean the skimmer baskets if applicable. Make sure to refill the pool to the proper level if necessary. Here I’m using a Pool Sentry to fill the pool. It will automatically shut off the water once the pool reaches the right level, which is great if you’re prone to forget that you were filling the pool. I’ve found it to work great. Also remember to open back up any pool valves you closed. Once you’ve got all the air out of the system and everything’s running as normal, take note of the pressure value. In this case it was roughly 10 PSI. Then, simply align the green arrow with the pressure. Once the pressure rises to the red arrow, the filter needs cleaning again. Before taking the pressure measurement, remember to open all the inlets and outlets and turn on the pump. Open the bleeder valve at the top (as pictured) to purge any air. Now would be the time to take a pressure measurement. Turn on the pump and make sure you’ve purged all the air from inside the filter housing. You’ll know you’ve properly purged the system when a steady stream of water flow from the manual air relief valve. Not air, or an air and water mix. Also make sure you select the highest pump speed if your pump has variable speeds. In this case the pressure dropped from almost 20 PSI back to under 10 PSI, which corroborates a job well done. Take note of this pressure so you’ll know when it’s time to clean the filter again (when the pressure increases by 8-10 PSI). Though the filters are rugged, they aren’t eternal. You won’t be able to clean a Hayward pool filter as pictured here forever. When these filters were first installed, the pressure was around 10 PSI. After cleaning, the pressure went from 18 PSI back down to 10 PSI. The filters should be replaced (and not simply cleaned) when the pressure after cleaning is around the initial pressure plus 6 PSI. That means that if I were to have measured 16 PSI after cleaning (instead of 10 PSI), it would be time to replace the filters at the next cleaning interval. It may have been a hassle, but the result was worth it! Finally! The ordeal is over! Now you know how easy it is to clean a Hayward pool filter. You can be proud of having tackled the job instead of postponing it for a few weeks more. Hopefully this will buy some goodwill with your better half, too. You know you earned it. 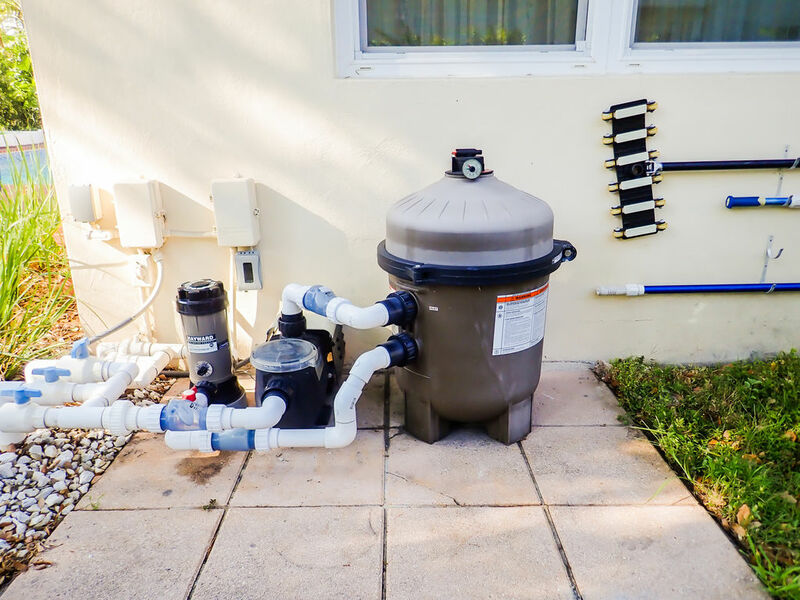 It is intuitively obvious; however, in Step #8, include refilling the Hayward pool filter housing with water after cleaning, because the next sentence you say replace the filters to keep them wet. You tried to catch a goof there, eh? 😉 Actually, from step #4: “After a few hours I drained the fluid out and sealed it up. That way I could simply let the pump circulate (with no filters) to keep the water chlorinated.” The filter housing was already full of water with the pump on just to keep the water moving, albeit without filtration. Good try, though. And thanks for reading!